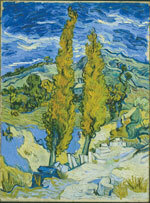 This exhibition brings together 84 acclaimed European paintings and sculptures from the late 19th and early 20th centuries, including works by Paul Cézanne, Salvador Dalí, Edgar Degas, Paul Gauguin, Henri Matisse, Claude Monet, Pablo Picasso, Pierre Auguste R enoir, Georges Seurat and Vincent Van Gogh. Together, these works illuminate the spirit of innovation and creativity that marks one of the most extraordinary epochs in the history of art. Dr. William H. Robinson, curator of the Monet to Dali exhibition, will present an overview of the Cleveland collection, as well as aspects of his new research on the works of Vincent van Gogh and Pablo Picasso. Since 1992 Dr. Robinson has served as Curator of Modern European Art at the Cleveland Museum of Art, and was appointed as Head of the Department of European and American Painting and Sculpture in 2003. 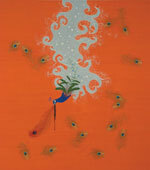 This exhibition has been organized by the Cleveland Museum of Art. New York artist Angelo Filomeno employs embroidery and appliqué on shantung silk in the creation of shimmering images, in which sharp-fanged skulls and prancing skeletons interact with such beautiful elements as peacocks, feathers and butterflies in modern versions of the danse macabre. Filomeno’s work is on view in the 2007 Venice Biennale, the theme of which, “Think With the Senses, Feel With the Mind: Art in the Present Tense,” perfectly encapsulates the sensuality and intellectual depth of the artist’s embroidered images.